Can you believe it’s almost September and school starts in just one week? Where did the summer go? 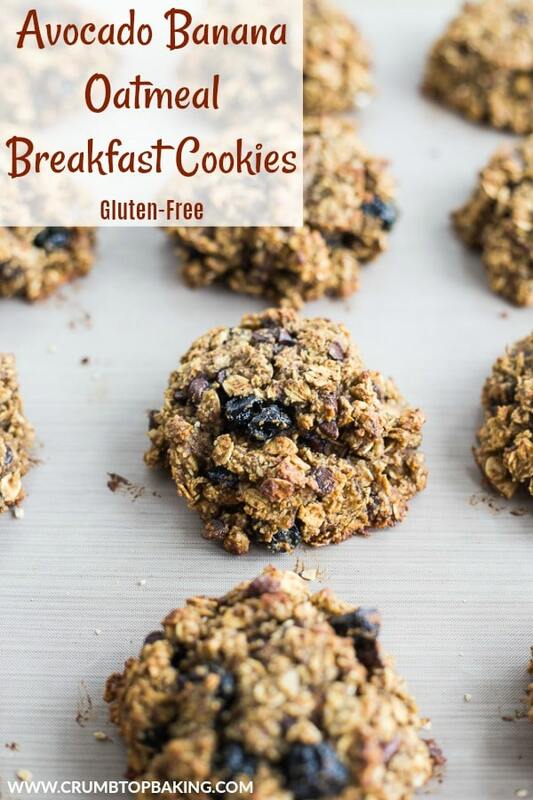 While I’m still hanging on to some summer vibes for at least another week, I really couldn’t wait to share this recipe for Avocado and Banana Oatmeal Breakfast Cookies. They are perfect for back to school – clean eating, filling, and loaded with protein, fibre and healthy fats. Oh, and did I mention they are delicious? Picky eaters will never know they are healthy! While we’ve enjoyed some beautiful weather this summer, my mind has already turned to fall and I’m totally looking forward to September. I might not be heading back to school, but September always feels like a great time to start something new, or in my case, get back into a routine. And that routine includes clean eating and regular exercise. Not that my summer hasn’t included clean eating and exercise, but it’s so easy to stray from that routine when you can use summer as an excuse! Warm weather calls for endless appetizers (like this hummus) and refreshing beverages, does it not? So, with that said, hello September and welcome back routine! It might be painful at first, but we will be friends again. And to help us along the way, I’ve created some new clean eating meals and snacks, like these Avocado and Banana Oatmeal Breakfast Cookies. 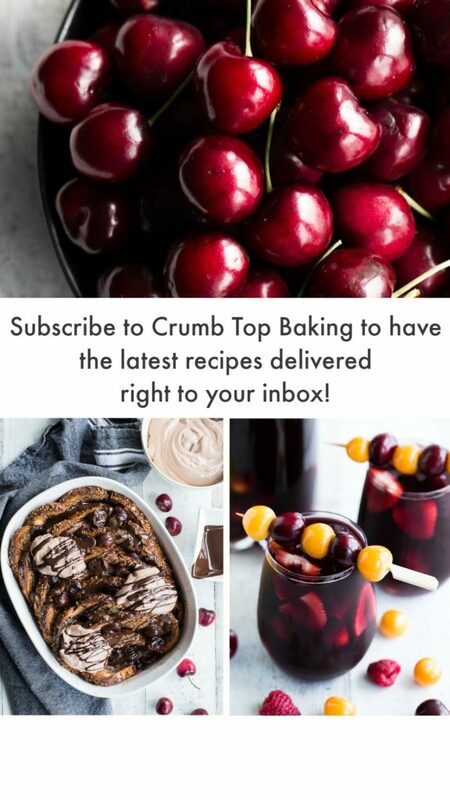 They are like a baked oatmeal, except you can eat them on the go, and they taste like a banana bread, with the texture and size of a muffin (okay, muffin top). Avocado. Instead of butter, I used a full cup of avocado. Amaaaazzzzing! And have you tried frozen avocado chunks? Life changing. Actually, one of my good friends/taste testers introduced me to frozen avocado and I’ve been using it in my baking ever since. If you haven’t tried it, it’s worth a go. It’s pretty convenient and cheaper than buying fresh avocados, although I still buy my share of those too 😉 . No flour. 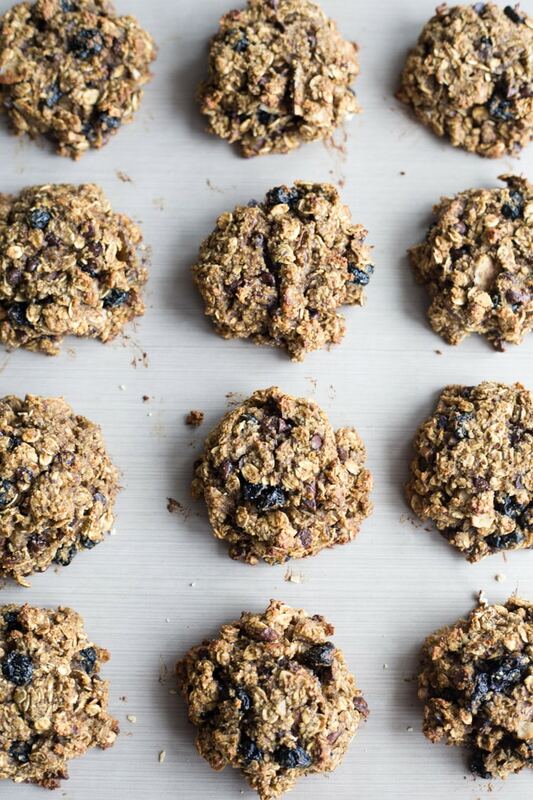 These cookies are gluten-free, using just ground almonds and gluten-free oats. Lots of protein and fibre from the almonds, oats, eggs and avocado. Versatile. When I make these (and I’ve made 4 batches in the last week), I add dried blueberries or cherries, chocolate chips, coconut chips and pecans. But you can add any type of dried fruits, seeds and nuts that you like! 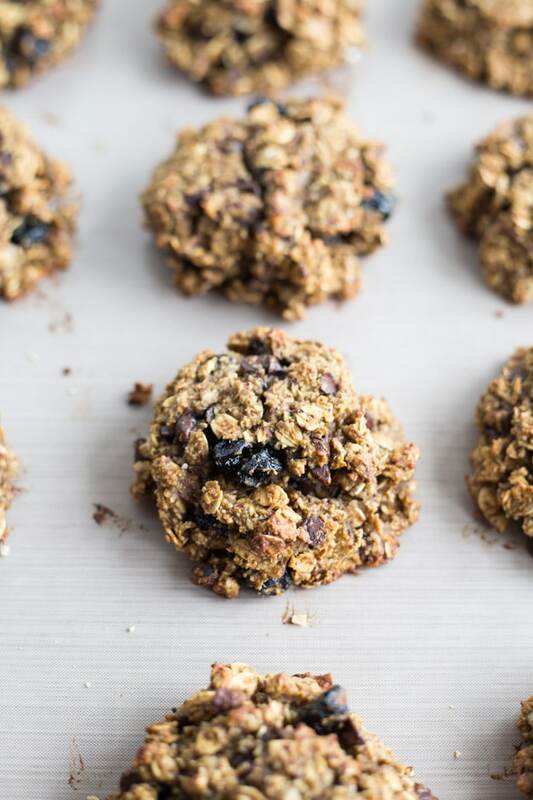 These Avocado and Banana Oatmeal Breakfast Cookies take only 25 minutes to make and you barely need to dirt up any dishes. I just throw all the ingredients in my blender. The recipe makes 12 large cookies, so you will have plenty for yourself and to share (or to freeze for later….for yourself and not share 😉 ). Pre-heat oven to 375 degrees and line a baking sheet with parchment paper. In a blender, add the avocado, banana and sugar. Blend on high for 1-2 minutes until mixture is smooth. Add the 2 eggs and vanilla and blend on high for another 30 seconds or so. Add the ground almonds, baking soda and salt, and blend for another 30 seconds, or until combined. 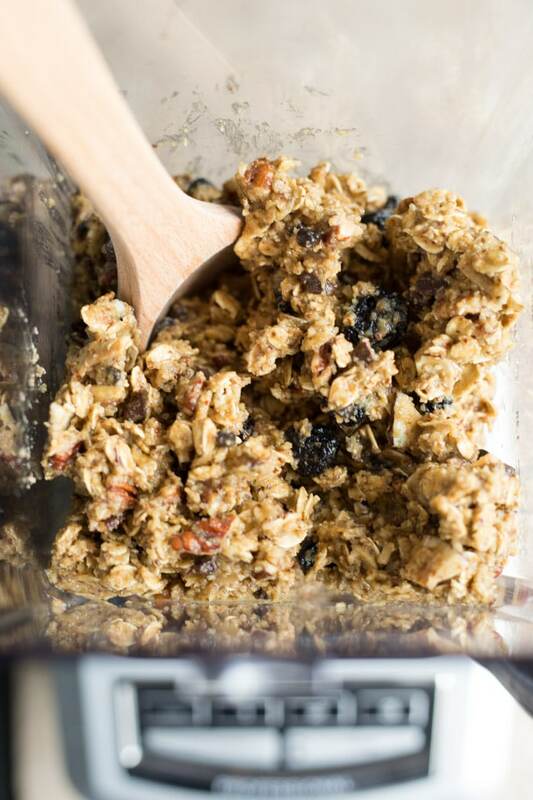 At this point, you can pour the batter into a large bowl and stir in the oats, blueberries, coconut chips, pecans and chocolate chips. But I usually just throw these ingredients into the blender and stir them into the batter. Do not blend in these ingredients! Using an ice cream scoop, place mounds of the cookie dough 1/2 inch a part on the baking sheet. You should get 12 large cookies. Flatten them a bit on top with a spoon. Place in the oven and bake for 13-15 minutes, or until the edges are browned. Remove from the oven and let cool on the pan for 15 minutes, and then move to a wire rack to cool completely. Store in an airtight container on the counter and eat within 3-4 days, or store in the freezer for later enjoyment! I used frozen avocado chunks (President’s Choice brand) in this recipe. I just defrost them slightly in the microwave for 30 seconds so they blend more easily. I opted for ground almonds in this recipe, instead of almond flour, as I prefer the slightly coarser grind of ground almonds. 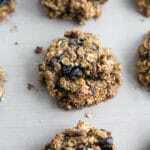 I didn’t try almond flour in these cookies, so I’m not sure how it would change the texture. 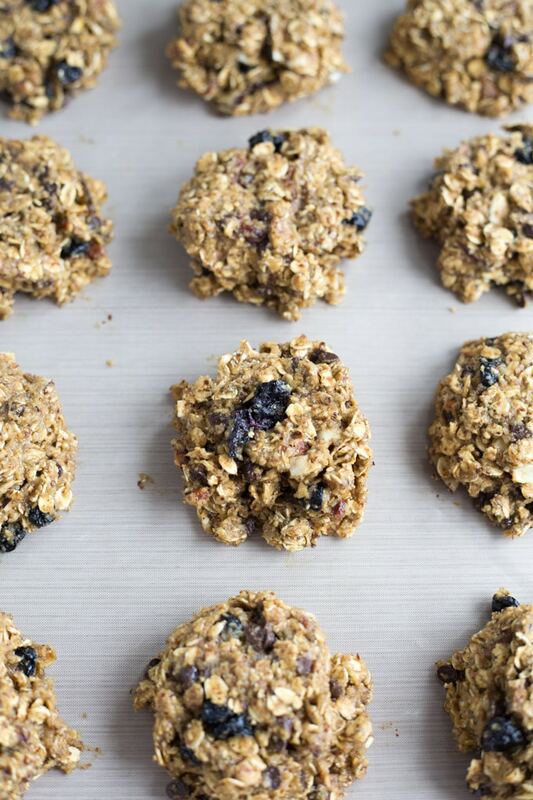 I added coconut chips, blueberries, pecans and chocolate chips to these cookies, but you could add other dried fruits, nuts and seeds. Just make sure you keep the quantities consistent with what is listed in this recipe.